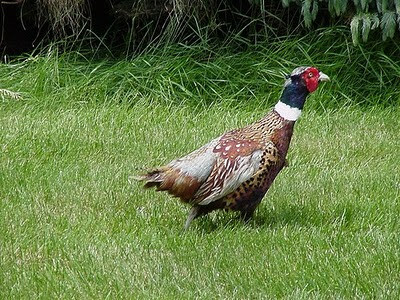 A rooster pheasant appeared in the back yard yesterday. Sister Beth was here with grandson Isaac, and he chased it around until it grew nervous and flew off. It is a bird!, he announced, after watching it fly. The skeptical 4-year old, he doubted it was a bird until it spread wings and took off. Much to his wonder and delight. He was never in any danger of catching it.